From a letter by Judge Thomas Burke, a principle in the SLSE to Captain A.B. Wycoff. ..."North Yakima is and will be, a good interior town. It will never be a very large place, but it has a good country to support it, and is likely to remain an important place. I should hesitate, however, to put much money there. The reason why I should, will be obvious to you, if you will take note of the towns in the interior of Illinois for instance. I was in Springfield last summer, and I took pains to inquire the price of city residence property, and I was surprised to find that there was hardly any market for it at all. Three or four cities with Chicago, of course, in the lead, seem to absorb everything. Is not the same thing likely to happen in Wash. Ty.(territory) ? There will probably be one or tow large towns in Eastern Washington. One of these, I think, will be Spokane Falls; and North Yakima, Ellensburg, and a town at the mouth of the Wenatchee where the S.L.S.&E. Ry. will cross the Columbia, will contend for second place;--and which, will capture the prize it is hard to tell..."
My fascination with this picture is the Central Washington Railroad grade out of Coulee City is more visible than in recent satellite views. Highway construction in later years obliterated parts that are visible in this view. Image taken from Beezley Hill. The only thing still standing in the photo today is the depot, about 5 cars behind the steam locomotive. Ephrata has seriously grown in the last 100 years. Of note is all the trees and the development on the hill above the depot. As done by the Northern Pacific in 1922. 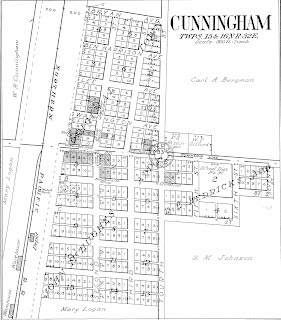 Maps and information can be seen here and here. This undated view is before the remodel back in 1966. The 1980s were a time of great changes in railroading in general, and Grant County in particular. The railroad industry was anticipating the great changes to be brought about by deregulation, which removed a great amount of control from the Interstate Commerce Commission. The Milwaukee Road, in its final bankruptcy, declined then disappeared. The Burlington Northern continued to downsize its holdings and prune many miles out of its tracks in the county. When Amtrak formed in 1971, it bought the 1950s-era passenger cars and locomotives from other railroads canceling passenger service. By the 1970s, the cars were old, getting more expensive to maintain, and still steam-heated and cooled. When money was made available for Amtrak to acquire new cars soon after, plans were made to acquire bi-level cars based on ones built in 1956 for the Santa Fe Railway (these were purchased by Amtrak when it started up). The initial order of 235 Superliner cars was placed on April 2, 1975, later being increased to 284 cars for $241 million in total. The first coach was delivered in October of 1978, followed by a full complement of coaches which debuted on the Chicago-Milwaukee service on February 26, 1979. It wasn’t until a full eight months later that enough other types of passenger cars had been delivered to make up a long-haul train; the westbound Empire Builder from Chicago to Seattle, via the old Great Northern mainline through the county, carried the first full consist of Superliners in the nation. When the Milwaukee Road was in its bankruptcy period, traffic on the Moses Lake branch was considered very lucrative and was thought to be an important part of keeping the railroad afloat. In 1979, a potato shipper operating facilities in both Moses Lake and Othello committed to shipping an additional 1,000 refrigerated piggyback trailers long haul to Chicago if the Milwaukee agreed to maintain service; another 1,000 refrigerated long-haul trailer shipments to points east of this were committed by the Pacific Northwest Shipper's Association as part of the reorganization of the Milwaukee. American Potato separately guaranteed 232 carloads long-hauled through Chicago. U&I sugar promised 426 carloads from a place called Scalley (which the locals would eventually call Wheeler) to Minneapolis if equipment was available. This was all long-haul and represented an additional $2-3 million in revenue available to the Milwaukee if it elected to upgrade its tracks and not abandon them. “It had the lowest-cost operation of its peer railroads, it was the most profitable and fastest-growing part of the Milwaukee System – and yet the abandonment of Lines West was said to be the most important priority when the bankruptcy court Trustee took over the Milwaukee in 1978. After he positioned the line for abandonment by driving off traffic and withdrawing service, his receipt of a consulting report, stating that the only realistic likelihood of a successful reorganization of the Milwaukee Road had to include Lines West, led to his abrupt resignation. Certainly, the large Seattle newspapers saw that Washington State’s governor at the time was entirely reliant on a Burlington Northern vice president for her political position and her opposition to efforts to save the Milwaukee may have proved fatal to the effort. 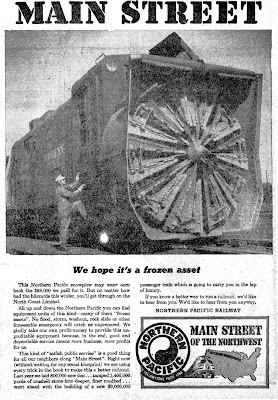 The Seattle P-I remarked in an editorial April 27, 1986: ‘We let rail competition across the Northern Tier states slip away six years ago, thanks to a disinterested Governor Dixie Lee Ray and a less-than-aggressive port. Their lack of action spelled the end of the Milwaukee Road.’"
Milwaukee Road trackage in Grant County that was abandoned outright on March 1, 1980, included the following: the mainline to Warden eastward to Miles City, Montana; from Royal Junction westward to Easton; from Warden to Sieler on the Moses Lake Branch; and from Tiflis to Ruff and beyond on the Marcellus branch. On August, 21, 1980, Burlington Northern bought the section between Warden and Othello, and the remaining branch to Moses Lake, since there was great traffic still to be had in those areas. BN had been providing service over these lines due to a March, 18, 1980, ICC order to continue service. Cash price averaged $52,500 per mile. Up to this time, the BN had crossed over the Milwaukee mainline at Warden on a bridge, but to make a better connection between the two lines, BN created a single-grade connection, getting rid of the expensive-to-maintain bridge. Part of the Moses Lake branch was abandoned between Warden and Seiler, with the spur track from Seiler now connecting to the BN track at Scalley, the old location of the U&I sugar plant. This is the current arrangement today. The Milwaukee Road depot in Moses Lake was torn down in the fall of 1981, after standing empty for a time, because of the general decline of the railroad. Not long after all these changes, the major eruption of Mt. St. Helens caused the railroads some measure of grief. The westbound Amtrak Empire Builder, which had been held at Spokane until the next day, picked up over 140 stranded I-90 motorists at Cheney, Ritzville, Lind, and Sprague, and brought them to Seattle. An eastbound train also carried emergency breathing equipment on May 21 to several law enforcement agencies in Eastern Washington. Everything northeast of the Cascade Mountains on the BN was covered with up to six inches of ash as far east as the west side of the Rocky Mountains at Essex, Montana, in Glacier National Park. The Railroad coped with this fallout by changing all locomotive filters daily, and was able to continue limited transcontinental mainline operations under considerable delays. In addition, it was necessary to cancel all train operations for several days on the Portland-Seattle via Tacoma mainline due to flood-threatened bridges over the Cowlitz and Toutle Rivers in the vicinity of Centralia, Kelso and Longview. In an odd twist, the NP (and later the BN), because of its land grant dating back to the 1860s, owned the land that formed the top of Mt. St. Helens. The BN deeded the summit back to the United States, minus the 1,314 feet that had blown away, for inclusion in the Mt. St. Helens National Volcanic Monument in 1982. On October 14, 1980, President Jimmy Carter signed the “Staggers Rail Act” into law, significantly deregulating the American railroad industry. Among the many changes it allowed, those that affected Grant County the most were the streamlined process allowed for abandoning unprofitable branch lines, and the right given to shippers to make rate increases, rather than the previous across-the-board increase. The BN acquired the St. Louis-San Francisco Railway on November 21. This merger removed many of the remaining GN and NP people in management, allowing the Frisco to control the newly-enlarged BN. 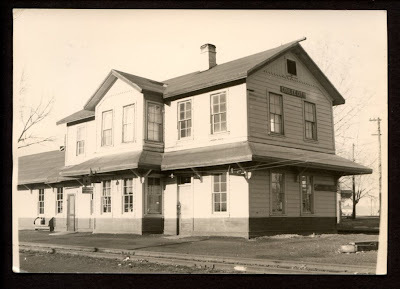 Closer to home, the Ephrata depot, which had been expanded in 1944 to 41x 204 feet, was now shortened to 48 feet long in 1981; Amtrak didn’t use the building, and the BN didn’t need the full space. In October of 1981, the Empire Builder returned to the former GN line at the request of the BN, who was trying to close its line over Stampede Pass. The new executives from the Frisco thought that having three railroad lines across the state was one too many, so they chose to close the most expensive to operate the other, the line over Stampede Pass. When Amtrak at its inception took over the Empire Builder, it had chosen to operate the train via Spokane, the Tri-Cities, Yakima, Auburn, to Seattle; now it would operate via Spokane, Wenatchee, to Seattle. The effects of the Staggers Act finally hit the area hard in 1983 when last of the NP Wahluke branch between Sagehill (near Mattawa) and Basin City was pulled up. Part of the NP Connell Northern branch between Wheeler and Adrian was also let go. Long-standing buildings were closed too. 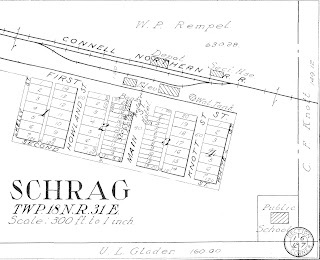 The Krupp/Marlin depot on the old GN was retired in 1984, due to age and consolidation of depot agents in a centralized calling center, instead of in the communities the railroad served. Grant County was not the only one losing rail during this time period. The Palouse area saw the bulk of its rail let go during this time. Discussion of abandonment of the branch in Douglas County, from Columbia River to Mansfield, caused the Central Washington Grain Growers to expand their facilities in Coulee City to take over grain shipments if the line to Mansfield was abandoned. Construction of a new 210,000-bushel grain storage and speedy grain-car loader was started in 1984 and completed a few months later. The BN sold a large part of its Grant County operations to the Washington Central Railroad Company (WCRC), which started operations on October 13, 1986. While the bulk of the new WCRC operated in the Yakima area, a busy section was operated out of Warden. One part was the old Connell Northern branch of the NP that ran from Connell to the end of track at Wheeler. There was also the spur track off this line at Bassett Junction to Schrag. It also included parts of the Milwaukee Road that the BN had purchased after the Milwaukee had pulled out; these tracks involved part of the mainline between Warden and Royal Junction, and part of the Moses Lake branch from Seiler. BN was selling off many of its branch lines over its network; the sale of lines to the WCRC allowed the BN to retain the long haul of freight, but disposed of the expensive operation of the branch line. The new short line had lower costs and would help retain freight traffic on the branch. Derailments at Quincy capped both ends of the decade. While the one in 1979 was pretty small, the 1989 one saw locomotives on their sides, railroad cars accordioned into a pile. The train had hit a car trying to cross the tracks, which was then dragged into a switch in the track. The only fatality was the driver of the car. The 1980s were one of the biggest eras of change, while the 1990s were to see the era of mega-railroads. Many people were upset by the loss of Milwaukee, but those outside the fracas didn’t seem to notice the railroad’s existence. All railroads were generally considered invisible to all but the interested few by the time the next decade rolled around. From "Treasure Hunters Guide to Washington #2"
"(A) story of this area was told...by a former deputy sheriff of Chelan County. 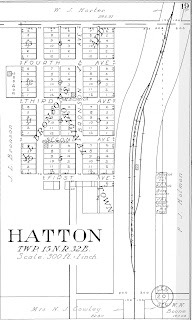 About 15 miles southwest of Harrington is a siding called Downs, on the (Great Northern) Railroad. Near this end of a double track at one time there was quite a large community. It was a complete little town, and had most trading establishments including a bank. A lone robber rode up on horseback one day and took away the total assets, mostly gold. He rode away to the southwest across the scabland, following a natural slope. Just upstream from Trinidad was a posse which had preceded the robber and tried to nab him. He escaped by jumping into the Columbia River. This was a bad try, the robber escaped, was drowned. The sheriff and posse looked for the loot; they went over the body and searched saddle bags, but found none. They tried to backtrack his trail from Downs, but the scabland, made up of sage brush and rock outcroppings, had hundreds of places for a cache. They found nothing. The loot is still missing."